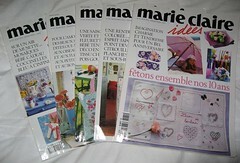 While we were living overseas, I had the good fortune of coming across these Marie Claire Idees magazines. They are French and are published quarterly, so through our travels, I managed to pick up a few of them. They are the most inspirational magazines I have ever come across, they have some fabulous ideas, they are typically all about making even the plainest thing look absolutely beautiful (typical French style) and even though they are all in francais, they have some good notes in the back on embroidery techniques which I quite liked. I would really like to work on my embriodery skills and be able to sit in the evening working on cute little embellishments.